Atlantans John and Mary Ellen Imlay are honoring the legacy of golf legend Bobby Jones with gifts to Emory's James T. Laney School of Graduate Studies. Philanthropists John and Mary Ellen Imlay have made a $1 million estate gift to the Robert T. Jones, Jr. Program in Ethics endowment at Emory University’s James T. Laney School of Graduate Studies. In addition to the couple’s estate gift, the Imlay Foundation has awarded $50,000 to the Jones Program in Ethics. A longtime member of the Bobby Jones Advisory Committee at Emory, John Imlay launched the Friends of Bobby Jones, a nonprofit organization dedicated to celebrating the memory of Jones, a world-renowned golfer who set a high standard for achievement and conduct. Imlay knew Bobby Jones personally and knew of his integrity both on and off the golf course. “We are proud to support this program so the legacy and integrity of Bobby Jones will be passed on to new generations of scholars,” Imlay said. “Like Bobby Jones, John Imlay is an extraordinary individual who sets high standards for achievement and conduct. John and Mary Ellen’s gift enables the Laney Graduate School to extend the legacy of Bobby Jones through scholarly integrity and research ethics for all Emory doctoral students,” said Lisa Tedesco, vice provost for academic affairs–graduate studies and dean of the James T. Laney School of Graduate Studies. Required of all Emory doctoral students, the Jones Program in Ethics is an integral part of the curriculum in more than 40 degree programs, with participating faculty from the humanities, social sciences, biomedical and natural sciences, public health, nursing, law and business. The program trains more than 300 students each year in the responsible conduct of research. Among the subjects the Jones Program in Ethics explores are ethics in data management, mentoring, authorship of research papers, peer review, collaboration, human subjects research, animal research, conflicts of interest, student-teacher relationships, public scholarship and scholarly misconduct such as plagiarism. The Laney Graduate School also is home to the Jones Biomedical Engineering Fellows program. The Bobby Jones Scholars and Fellows—an academic exchange program between Emory University and St Andrews University in Scotland—has served more than 230 students since its inception in 1976. Emory’s Manuscript, Archives, and Rare Book Library (MARBL) houses Jones’ papers—making Emory the center of Jones scholarship and research. The Imlays also have contributed to the growth of the Jones collection at MARBL. Jones was an alumnus of the Georgia Institute of Technology, Harvard University and Emory University School of Law. His story is a landmark in sports history. 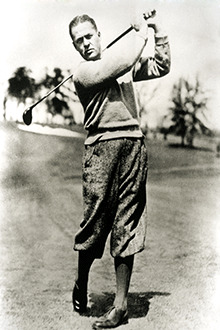 Born in Atlanta in 1902, he became recognized as a prodigy at golf. At age 28, he won the British and United States Open and Amateur championships—the first and only “Grand Slam” of golf.